Republic Services, Inc. today reported net income of $87.2 million, or $0.45 per diluted share, for the three months ended June 30, 2007, versus $70.8 million, or $0.35 per diluted share, for the comparable period last year. Net income for the three months ended June 30, 2007 includes a tax benefit of $5.0 million, or approximately $0.03 per diluted share, related to the effective closing of the Internal Revenue Service's audits of the Company's consolidated tax returns for fiscal years 2001 through 2004. Revenue in the second quarter of 2007 grew to $808.4 million from $779.8 million for the same period in 2006. Internal growth was 4.1 percent, consisting of a 5.2 percent price increase and a 1.1 percent volume decline. Operating income for the three months ended June 30, 2007 increased $19.1 million or 14.3 percent to $153.1 million, compared to $134.0 million for the same quarter last year. Operating margin for the three months ended June 30, 2007 increased to 18.9 percent from 17.2 percent for same period in 2006. For the six months ended June 30, 2007, net income was $141.1 million, or $0.72 per diluted share, compared to $135.4 million, or $0.66 per diluted share, for the comparable period last year. Revenue for the six months ended June 30, 2007 was $1,574.0 million compared to $1,517.3 million for the same period in 2006. Operating income for the six months ended June 30, 2007 was $267.8 million compared to $256.4 million for the same period last year. The Company's income before income taxes for the six months ended June 30, 2007 includes a $22.0 million pre-tax charge ($13.5 million, or approximately $.07 per diluted share, net of tax) related to estimated costs to remediate a landfill in Ohio. 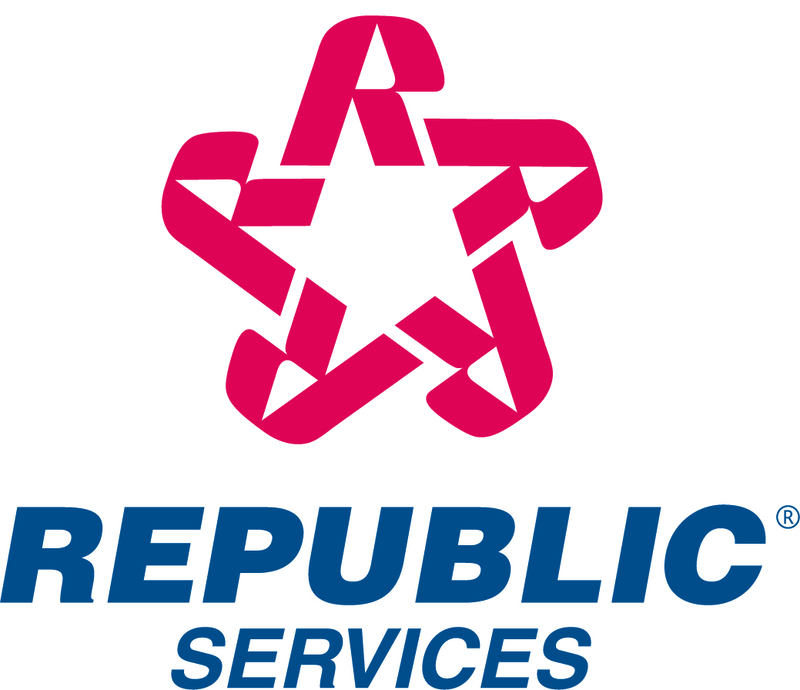 Republic Services also announced today that it is increasing its 2007 guidance for earnings per share and free cash flow to reflect the Company's performance for the first six months of 2007 and certain current favorable business conditions. was a range of $1.50 to $1.52 per diluted share. guidance for free cash flow was $315 million. expected to decline approximately 1.5 percent. Separately, Republic announced that its Board of Directors has approved a 60 percent increase in the Company's regular quarterly dividend from $0.1067 per share to $0.17 per share. The quarterly dividend of $0.17 per share will be paid on October 15, 2007 to shareholders of record on October 1, 2007. The Company also announced the continuation of a stock repurchase program following the Board of Directors authorization to repurchase an additional $250 million of Company stock in 2007 and 2008. "We continue to realize the benefits of our pricing initiatives which are driving our improving returns on capital and our expanding operating margins," said James E. O'Connor, Chairman and Chief Executive Officer of Republic Services, Inc. "The exceptional performance of our entire field organization is one of the main reasons behind our strong financial results. These results have permitted the Board of Directors to continue Republic's practice of distributing free cash flow to, and capturing value for, our shareholders by approving an additional $250 million for share repurchases, which is the cornerstone of our financial strategy, and by also increasing our annual dividend by 60 percent." The following information should be read in conjunction with the Company's audited Consolidated Financial Statements and notes thereto appearing in the Company's Form 10-K as of and for the year ended December 31, 2006. It should also be read in conjunction with the Company's Unaudited Condensed Consolidated Financial Statements and notes thereto appearing in the Company's Form 10-Q as of and for the three months ended March 31, 2007. During the first quarter of 2007, the Company recorded a pre-tax charge of $22.0 million ($13.5 million net of tax), related to estimated costs to comply with Final Findings and Orders (the "F&Os") issued by the Ohio Environmental Protection Agency ("OEPA") in response to environmental conditions at the Company's Countywide Recycling and Disposal Facility ("Countywide") in East Sparta, Ohio. The Company will also incur approximately $3.3 million of additional amortization and depletion expense during 2007 associated with a reduction of estimated remaining available airspace at this landfill as a result of the OEPA's F&Os, of which $1.6 million has been recorded through the six months ended June 30, 2007. During the six months ended June 30, 2007, cash provided by operating activities was $309.7 million, cash used in investing activities was $81.6 million and cash used in financing activities was $231.3 million. Capital expenditures include $1.3 million capitalized interest for the six months ended June 30, 2007. As of June 30, 2007, accounts receivable were $312.3 million, net of allowance for doubtful accounts of $13.9 million, resulting in days sales outstanding of approximately 34.6 (or 22.4 net of deferred revenue). In the second quarter of 2007, the Company recorded a $4.3 million reduction to its allowance for doubtful accounts as a result of the Company refining its estimate of its allowance for doubtful accounts based on its historical collection experience. During the three months ended June 30, 2007, the Company paid $94.4 million to repurchase 3.1 million shares of its common stock. During the six months ended June 30, 2007, the Company repurchased a total of 4.8 million shares of its common stock for $165.1 million. As of June 30, 2007, the Company was authorized to repurchase up to an additional $84.1 million of its common stock under its existing stock repurchase program. In July 2007, the Company's Board of Directors authorized the repurchase of an additional $250 million of Company stock. Combined, Republic has the authority to repurchase $334.1 million of its common stock. In April 2007, the Company paid a cash dividend of $20.7 million to shareholders of record as of April 2, 2007. As of June 30, 2007, the Company recorded a dividend payable of $20.5 million to shareholders of record at the close of business on July 2, 2007, which has been paid. In July 2007, the Company's Board of Directors declared a regular quarterly dividend of $.17 per share payable to shareholders of record as of October 1, 2007. (1) Certain amounts for 2006 have been reclassified to conform to the 2007 presentation.